Mike Bennett and & arrived at 6:30. It was much better than yesterdays rain/mist, there was a fresh 7mph breeze from the SSW and clear blue skies. Trying to solve the chest pain I have made some modifications and this was the first time to try them out. In order to position my arms farther forward I have moved the hangpoints 1 inch and to rebalance the rig, Mike and I mounted a 12 pound weight over the front wheel. The brake lines have been lenghtened 3 inches and the brake pulley was lowered by the same amount and drawn in closer to the riser. I will have to heal before I know if the problem has been fixed but I think I’m on the right track. It was definitely more comfortable and the pain is no worse. 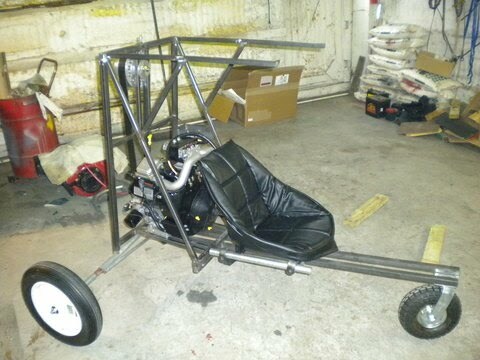 The next step will be to remount the battery forward of the seat this will not ad weight to the rig but allow the hang points to be moved another inch forward. Then I’ll play with the seat mount to get it dialed in. 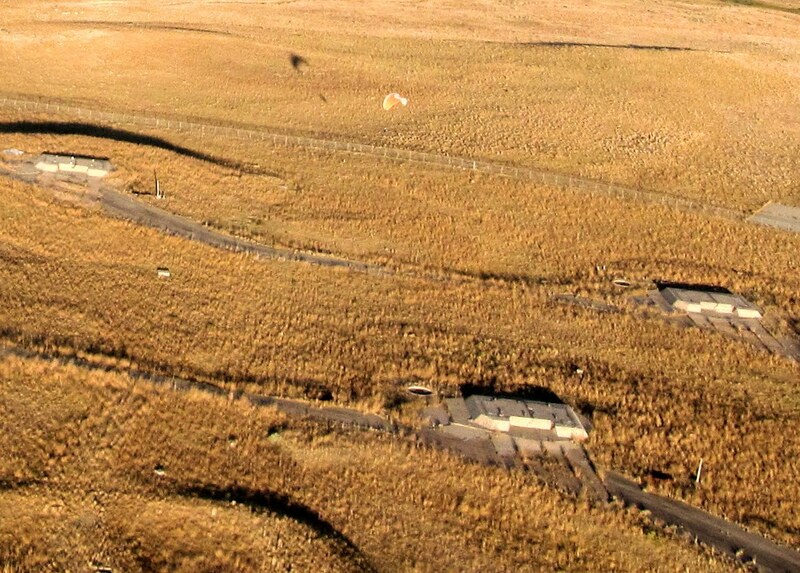 Mike and I flew into the wind SSW and overflew the old ICBM Missile Silos. The wind speed increased dramatically with altitude. Mike flew low and I flew 400 feet higher at a much lower speed. For the first time I flew with the trimmers out and enjoyed the Eden III ‘s much crisper response. On the return leg downwind I exceeded 50 mph. After a short break I went up again. The last several flights have all been higher wind and its been a good experience. The Eden comes up fast and sometimes pulls the trike back a couple of feet in the process but with a smooth surface it feels natural. The wing comes overhead … I ad throttle, start the roll and usually rotate within 50 feet. On soft terrain (sand) or worse…. bumpy (pasture) it may not be so easy. On this flight I stayed close to the patch and worked on steering. 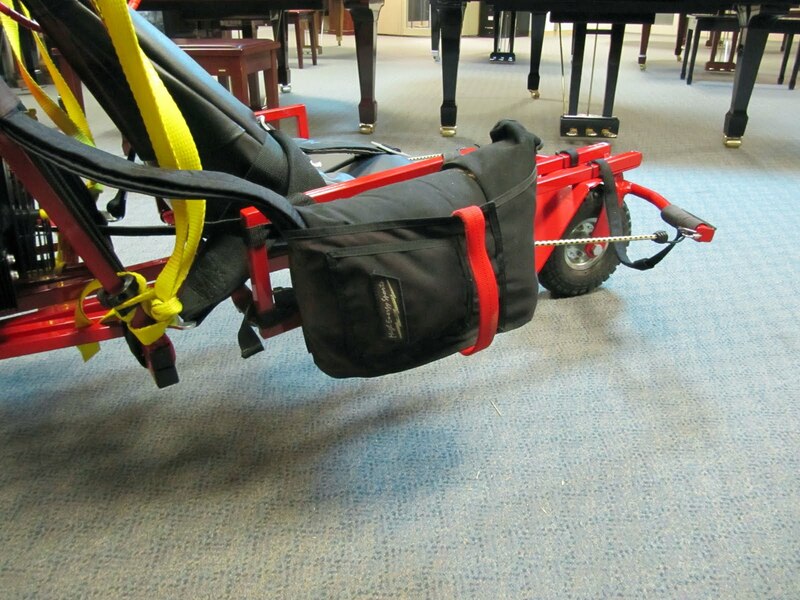 It is still not as comfortable as the trike buggy because I do not have the same range of motion. I don’t seem to have the power and it feels like I’m using different muscles. I can’t quite put my finger on the difference but I’ll work on it. Paul M arrived just before I finished the second flight, so I decided to go for three. It was starting to get thermic and was most bumpy over by the farm houses so I flew out to the gun range and crabbed back to the LZ. The winds at the surface were twitchy as hell and I had to go around twice before I felt good to land. Two of the three landings I popped a wheeley after touch down. Next time I’m NOT going to kill the engine at two feet but will either go in dead stick or under power and taxi. It was a good day. Tonight I added a back pad to see if it would solve the chest pain. Nope… I was more upright but it also moved me closer to the risers which moved my arms back even farther. It was a beautiful flight anyway, the winds were about the same as yesterday. Nice smooth laminer air. It was 27 degrees at 0600 hours. The skies were clear with no discernible breeze. I’d left the Falcon in the truck so it was just a matter of pulling on my cold weather gear and getting on the road. One of the best things about living with Chip is that Simms is only 5 minutes away. The field is looking better than it has in a couple of years. The heavy wet snows have packed the weeds down and other than a general bumpiness I’ve no complaints. The first attempt was botched when the wing came up crooked. The breeze had picked up a bit and I missed the shift. When I set-up the second time I adjusted and took off without problem to the West. Looking at the wing I thought the brake lines looked wrong. One line (left inside) seemed unusually slack. I couldn’t see a problem and when I tried some input it reacted ok, but… it didn’t feel right so I turned back and landed by the truck. On the ground I still could not find a problem, so I re-set and launched. The air was good and did not feel as cold as I knew it was. 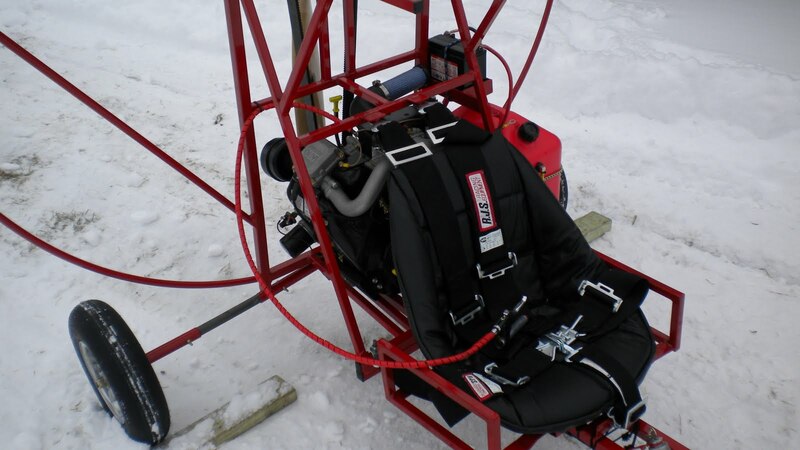 It was more comfortable with the seat positioned more upright but the brake lines are still too far aft. It pulls my arms back and stresses my shoulders. 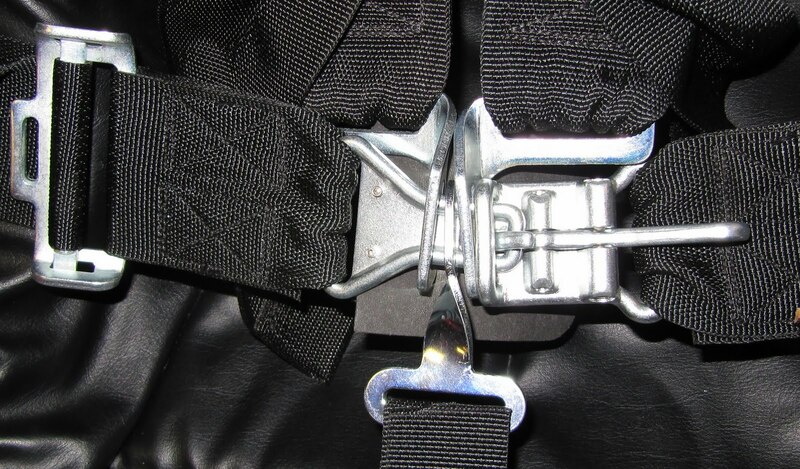 I’m not sure what the fix is…move the seat back… put some kind of line guide on the hang point rails. Maybe I just need to work on upper body strength. It’s better but there are still a few tweaks to get it right. The Falcon was climbing great. At 3400 RPM I had 290 ft/min and when I adjust the prop a little more I’m sure that will improve. Considering that I was 300 RPM below optimum 375 ft/min should be attainable. As I traversed Bear Creek Park it started to get bumpy. I had a clear view of Red Rocks, there were lots of cars in the parking lot but it didn’t look like a full house because the top 2/3rds of the seats were empty. It looked like the wind was going to pick up, there was a bank of hard blown clouds to the North. Concerned that I would get into a wind storm or strong turbulence from the up slope meeting the down slope…I decided to turn back so that I would be over home field if I needed to get down in a hurry. It would have been nice to buzz the amphitheater but no sense pushing it. The landing was good; the wind had come up considerably with a gust that popped me up on final. Fortunately I had plenty of room and landed close to the truck. This was a good thing to do. Getting ready yesterday and climbing out of bed before dawn occupied my mind giving me a little respite from the troubles that have been consuming my attention the past several months. The Colorado Thumper is sold and Terry Lutke is building a Falcon 32 H.P. Generac 4 stroke. Two months ago I traded in the beloved Simonini and became the proud owner of a Briggs and Stratton Trike buggy. 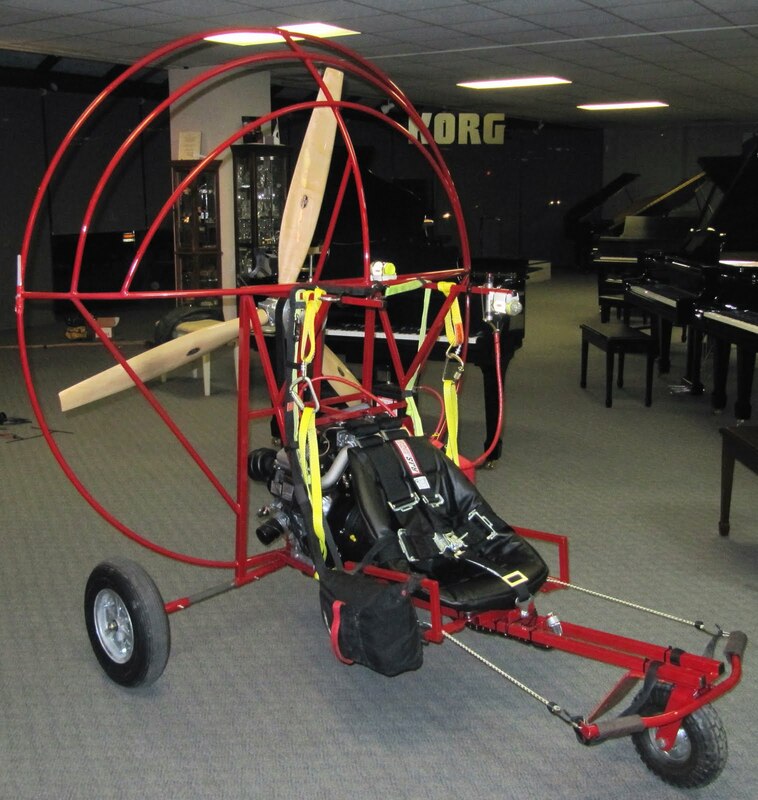 The 4 stroke power plant was designed and built by Terry Lutke and the Flexfoil Trike was developed for PPG by Chad Bastion. The biggest downside to going 4 stroke is the lack of fun things to do while not flying. Having spent the last 4 years immersed in this sport, I was comfortable with all the the wonderful little things that are a normal part of a PPG pilots life. The nights spent in the garage replacing compression springs or driving to the airport after dinner to pick up AV Gas. If I wasn’t searching the Internet for the best buy on Castrol TTS, I was waiting for the UPS man to deliver a 160 dollar starter sprocket. It seemed like I was either working on the maching or flying it. 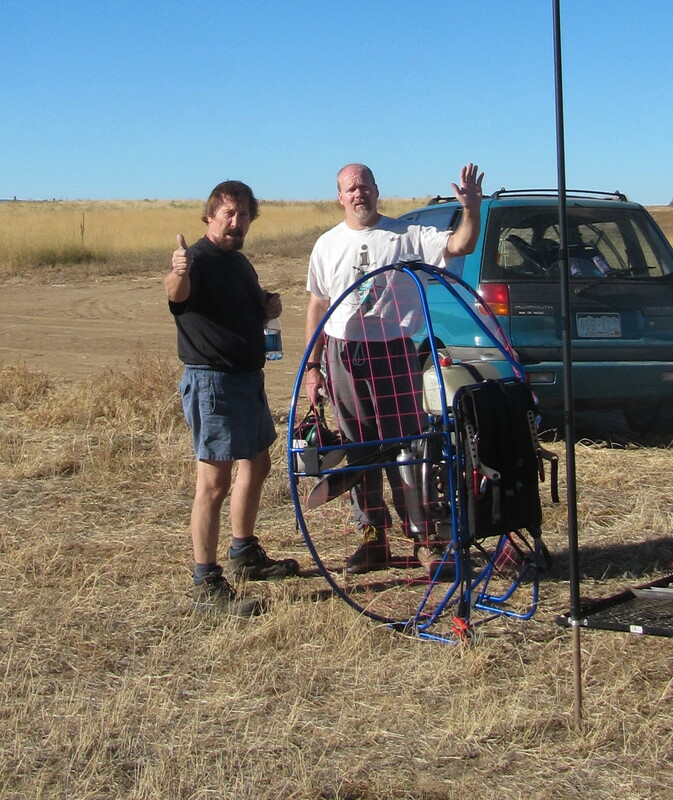 For every minute in the air there was an equal or greater amount of time occupied with the care and feeding of my 2 stroke paramotor. If it was blowing…no problem, I have a pull starter to rebuild. 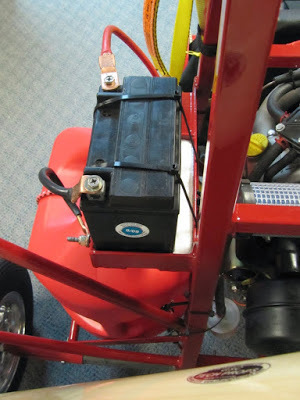 These days… things are different, because the heart of the “Thumper” is a Briggs & Stratton, twin V, 4 stroke motor. Thousands of these motors are built every year and the economy of scale makes it possible to produce a very affordable motor with excellent manufacturing tolerances and a beautiful fit and finish. They are designed to run 10,000 hours at peak horsepower, so it’s not unreasonable to expect to fly hundreds of hours with nothing more than an annual check-up and oil change. When necessary, parts and expert service are readily available at the local lawnmower repair. Gone are countless hours tinkering with the machine. No mixing fuel, exotic tools or translating owners manuals. Now ,when it’s too windy to fly, the best I can do is wish for better air. 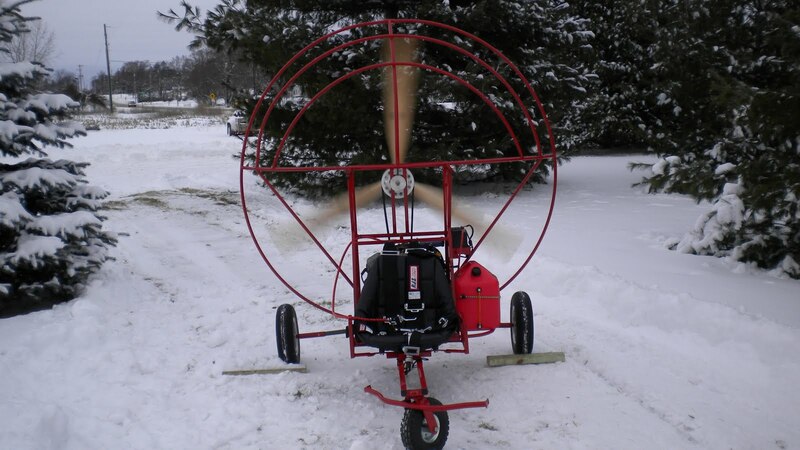 You still have to be ready for a “motor out” and have an emergency landing site within the glide slope but the reliability of this motor instills a confidence that allows for flights that would not have attempted before. But…. When it is flyable, the thumper is always ready to go and the first thing you notice is the happy rumble of the Briggs & Stratton. On my first flight it was so quiet that I completely forgot the step where I put in the ear plugs and put on the helmet. 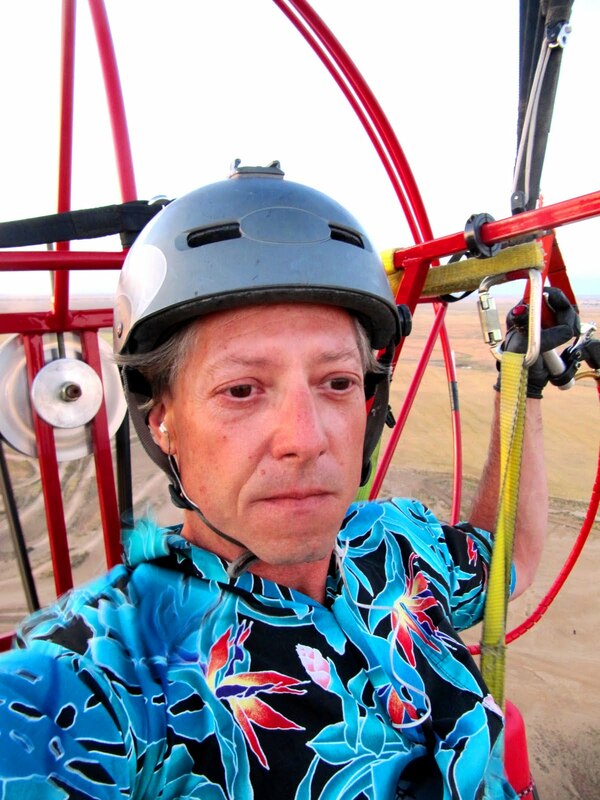 I realized my mistake just as I was taking off and few seconds later so did everyone at the Salton Sea when my ball cap went through the prop. …..WAAK….ear protection is still necessary but with a four stroke power plant, noise is reduced by thirty percent or more. At cruise with the RPM’s reduced it would not be impossible to use a cell phone. The next thing you notice is that the thumper doesn’t suffer from the constant vibration that plagues two stroke motors. Its eerie, when the prop is in balance and the motor is running for level flight, its possible to forget all about the power plant and enjoy the ride. Occasionally you will find a node on the power band that sets up a harmonic vibration, but it’s easy to bump up or down the RPMs to stay in the sweet spot. Flying a two stroke I was often ready to land at 45 minutes or an hour. Without the vibration I’m much more relaxed and feel like I’ll be able to fly as long as the gas and weather will permit. Cross country flights of 100 miles or more are certainly possible. Not for the con…Only one so far…There isn’t the instant power you get with the Simonini. I won’t be able to fly the contour of the surface like I used to. 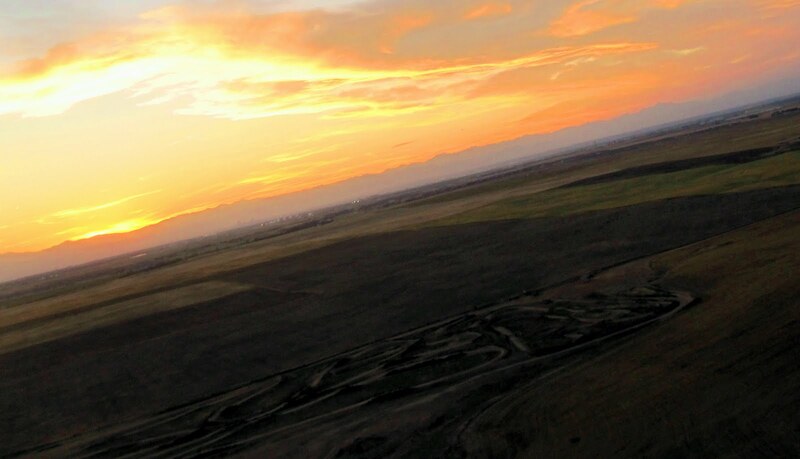 This year when I fly the dunes it will be from 30 feet above the tops instead of down in between the dunes. Flying the Thumper is going to require anticipating my power needs. It might be better with a different wing and it’s going to be fun to try them out.